Australian Tea Tree Fresh & White Toothpaste contains Aloe Vera, Co-Q-10 and Escin (from Horsechestnut). 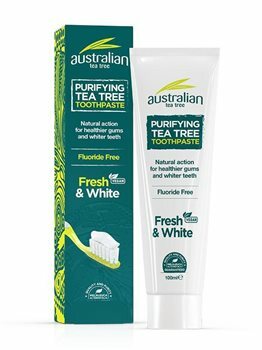 Regular brushing using Australian Tea Tree Fresh & White Toothpaste helps prevent the build up of plaque and tartar. Fluoride and SLS free natural protection for healthy gums and whiter teeth. Contains no artificial flavourings, only peppermint oil. Aqua, Calcium Carbonate, Glycerin, Hydrated Silica, Mentha Piperita Oil (Peppermint Oil), Hydroxyethylcellulose, Sodium Lauroyl Sarcosinate, Aloe Barbadensis, Menthol, Melaleuca Alternifolia Oil (Tea Tree Oil), Escin (Horse Chestnut), Ubiquinone (Co-Q10), Sodium Hydroxymethylglycinate, Xylitol, Citric Acid.